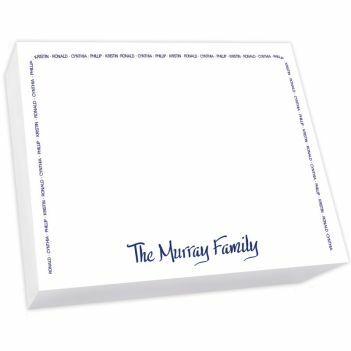 The Family Arch Super Slab - White features a bottom line of primary personalization and up to 10 individual names that create a border around the notepad. Printed in your choice of 10 fonts (for the bottom line) and 8 matte ink colors. Produced on our high-quality white paper text sheets.